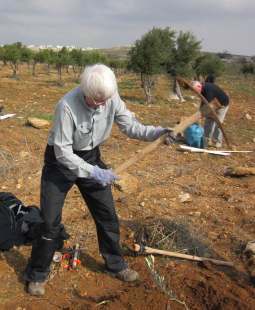 As of October 2017, the North Staffordshire Olive Tree Campaign, an arm of Sumud Palestine, has raised £10,473 to sponsor 698 olive trees at £15 each. The JAI Keep Hope Olive Tree Campaign marks its 15th anniversary this year and last year the campaign planted 11,700 trees in Area C which is 62% of the West Bank which is exclusively ruled by Israeli Military law. You can watch a documentary by JAI Palestine. The documentary tells the story of two farmers from Al Jab’a, a village southwest of Bethlehem whose farmlands were confiscated by the Israeli authorities in order to build and expand the surrounding settlements, to pave the Israeli-only by-pass roads, and lay down water pipes which pump out Palestinian water to the adjacent settlements around the village. These farmers have lost many of their olive trees at the hands of the settlers, and they tell their stories of loss and subjection to violence by the Israeli system and the Israeli settlers. They are forced to witness the expansion of the Israeli settlements on their own lands while they and their community are pushed out of the ever-shrinking area of their historic birth place. Since the beginning of the Intifada in 2000, it is estimated that more than two million trees and thousands of acres of farmland have been destroyed in the West Bank and Gaza by the Israeli Military Occupation. Palestinians are subject daily to land seizure, checkpoints, road blocks, observation towers, house demolition and travel constrained by the need for a permit or correct ID. Many farmers are separated from their fields by the Apartheid Wall or military zones and cannot tend or harvest their olives or other crops. 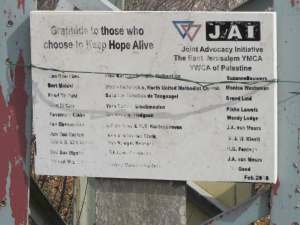 The names of sponsors of an olive tree are displayed on a plaque beside a field. This reaffirms for a farmer and his community that they are not forgotten and makes it a little more difficult for their land to be expropriated. Nevertheless many farmers wake in the morning to discover their trees have been felled or their crops destroyed. These incidents are increasing. 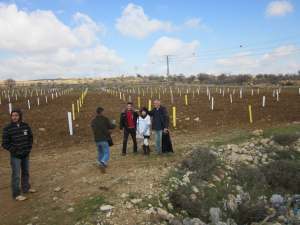 In February 2011, volunteers planted approximately 1600 trees for four farmers. Planting olive trees in stony ground with pick axes and mattocks was hard work. The glow of satisfaction when a field was planted was more than worth the effort! Before arriving at a field volunteers were warned that very probably members of the Israeli Defence Force would turn up and that they should be ignored. This proved correct on every occasion. The soldiers would talk in an intimidating way to the farmer before withdrawing.